Yesterday hygge was announced as one of the 'words of the year' by the Collins English Dictionary and if you walk into any bookshop in the UK at the moment you will see books on the subject piled high ready for the Christmas season. Like many others, I've noticed the word tip-toeing into our collective consciousness and I feel like hygge is exactly what we all need. A bit like how mindfulness reminds me to be in the moment, hygge reminds me that simple pleasures and a feeling of cosy contentment and security is important to our wellbeing. 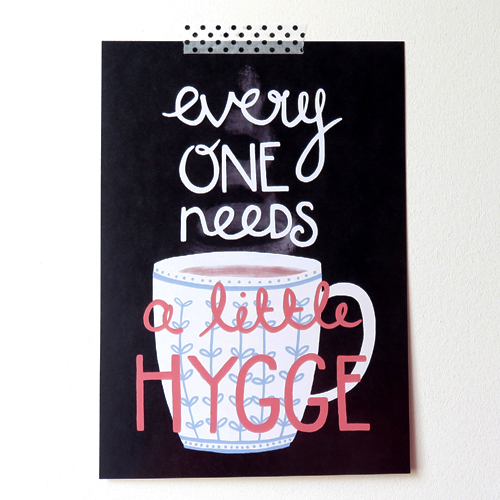 Hygge is all about the feeling of absolute peace and warmth which we sometimes forget in our frenetic world. It can be anything from curling up with a good book to enjoying a hot chocolate under a fluffy blanket or a cosy, wine-fuelled dinner with friends, all preferably by candlelight, although I think fairylight would do the trick.